IF A GOLFER CHEATS IN THE FOREST, DOES IT COUNT? My friend Dan and I looked at each other? “You sure?” we asked. We were playing at a Bangkok-area course in a friendly competition (loser buys the beer) against two acquaintances, one of whom was almost elected prime minister of Australia. 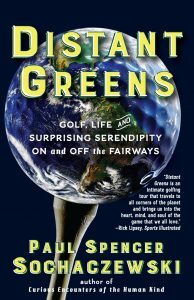 The almost-prime minister, who played off six, hit his drive into the hazard, near the water’s edge, and we glimpsed him nudge it out of the lakeside rough with his club, then bend down and place the ball nicely on a tuft of grass, and then take another couple of strokes to reach the green, then a couple of putts. Six? It was impossible to calculate his strokes because of his rules infringements. We went on to win the beer, but the incident got me thinking about how widespread cheating is in amateur golf. In a 2002 survey of 401 high-ranking American corporate executives, 82 percent admitted that they cheat at golf, usually by under-counting strokes or improving their lies. 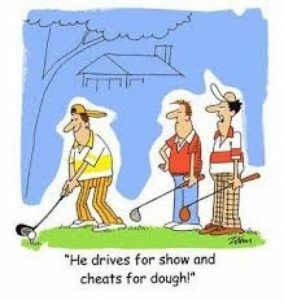 Golf is the only game where the golfer calls penalties on himself. It is a game of honor, even when the rules appear arcane and silly. For instance, on the course you can move a dead snake out of your line (“loose impediment”), but not a live one (“outside agency”). But life’s rules don’t have to make sense. They just are. Husbands and wives have their own illogical rules, as do parents, and bosses, and the IRS. You choose to follow them, or not. And, to their credit, pro golfers respect the rules, and by doing so, respect themselves. Maybe it’s simply the gentlemanly (yes, ladylike is also an appropriate term) way to behave. Maybe the pros know the rules and the amateurs don’t. Maybe it’s the knowledge that a spectator or TV camera is likely to pick up any infringement. But consider these acts of character-building behavior. Pundits say “it’s not a principle until it costs you money.” Brian Davis of England will earn karma credit for his principles for many years to come. Immediately after hitting his pitch from the hazard near 18th green at Calibogue Sound, South Carolina, during a playoff with Jim Furyk, Davis summoned a rules official. At stake: the 2010 Verizon Heritage title, which would have earned Davis his first PGA Tour victory and a two-year exemption. Davis had ever-so-slightly nicked a reed during his backswing. Barely moved it. It could have been a little gust of wind. To the naked eye, it was almost invisible. But not to Davis, who called a two-stroke penalty on himself that cost him the tournament and $411,000, the difference between the first place and second place prize money. According to Don Van Natta, author of First Off the Tee: Presidential Hackers, Duffers and Cheaters from Taft to Bush, the worst presidential golf cheats were Richard Nixon and Bill Clinton. According to Van Natta, Clinton even had the temerity to blatantly cheat during a round with Van Natta, knowing that the writer was there to document the president’s lack of ethics on the course. Combining cheating with insensitivity, George W. Bush was teeing off when some journalists asked for his comments about a suicide bomber that had just killed nine people on an Israeli bus. “I call upon all nations to do everything they can to stop these terrorist killers,” the president intoned. “Now watch this drive.” Bush hit a ball into the rough, grabbed another ball and hit his mulligan straight. (Neither “gimme” nor “mulligan” are mentioned in the golf rules.) “Hard this early in the morning to loosen up,” Bush said to the scribbling reporter. Boxing champ Oscar de la Hoya said Trump broke the rules numerous times in the two holes the men played together. On one hole, according to de la Hoya, Trump’s first shot landed in the water. The next went out of play. The third sliced back into the water. And the fourth was lost to the surrounding bushes. Yet Trump drove his cart to the middle of the fairway and declared that the ball lying there was his first drive and played from there. Similarly, on the next hole, a par-3, when de la Hoya saw Trump’s tee shot sail into the bushes, Trump “found” his ball three feet from the hole. And then picked it up, claiming a gimme. The stigma of being called a cheat is as persistent as malaria in the blood. In 1985, when he was 22, Vijay Singh was banned from the Asian tour by the Southeast Asia Golf Federation for modifying his scorecard in the Indonesian Open by one stroke so he could make the cut, an allegation Singh denies. As a result Singh spent two years in the wilderness, working as a club pro at two courses in Malaysian Borneo. Maybe it was a good thing that my Australian acquaintance never became leader of his country. Does any country need a leader who doesn’t play fair dinkum?